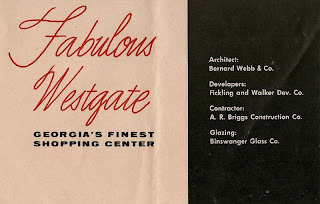 In two other posts, I discussed the long-demolished Westgate Mall/Shopping Center in Macon, GA. 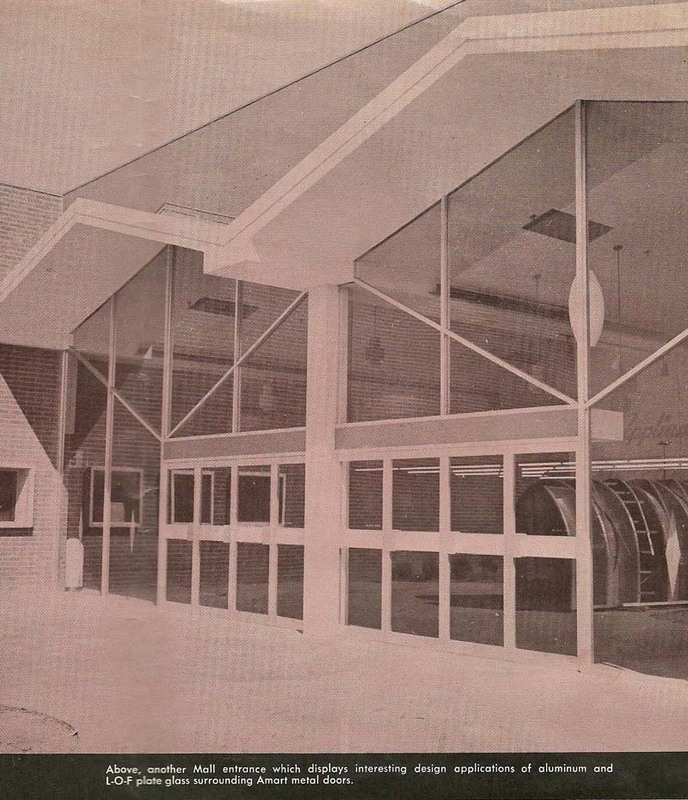 While largely unknown outside of the city, it was not only the first enclosed mall in Georgia but probably also the first dead mall in Georgia. A mall that lost its reason to exist by 1975, it was marketed in various forms for 19 more years before being de-malled in 1994. If this had been anything but the first of its kind in the state, probably no photos would exist. However, contributor Tony Webb was kind enough to inform me that he had some photos of the place, and he went to the trouble of getting them for this site. 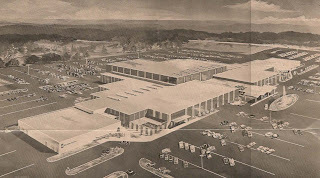 His father, Bernard Webb, was the architect of the mall and Tony had a brochure from a local glass company showing the mall just before it opened. Most of these photos involve the exterior, though a couple store fronts are featured inside. I think you will agree from these photos that this was a very uniquely designed mall even for its time. All images below are from that brochure sent to me by Tony Webb. This is the artists drawing from the air. The anchor on the left is Colonial Stores (later Big Star), and the tall anchor in the rear is J.J. Newberry's. The grocery store on the opposite end is Big Apple (later Food Giant). Woolworth's is shown between the front entrance and Colonial Stores. Liggett Drug is shown on the left between the front entrance and Big Apple, which also had an outside entrance. Liggett eventually became Eckerd Drugs at the last. A look at the front entrance. This looks substantial enough that you would expect a much larger mall inside! I guess this place WAS huge for 1961. 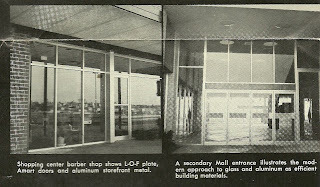 Here is another mall entrance with the caption from the original brochure left in place. 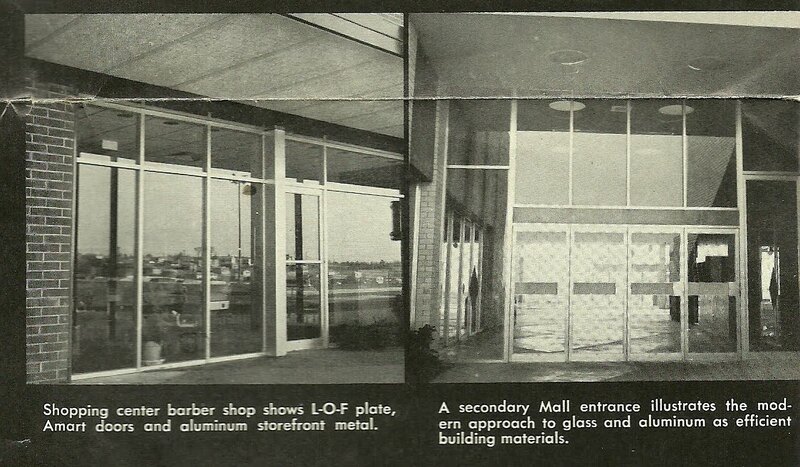 Here is an outside entrance to a barber shop and a side mall entrance, which looks more typical for the 60's. 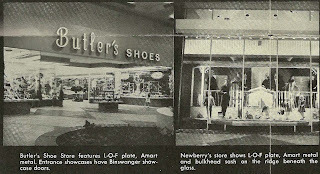 The store front of Butler's Shoes and mall entrance to Newberry's are both pictured here. 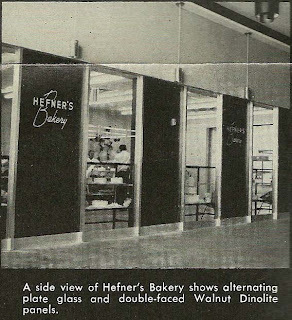 Hefner's Bakery looks positively classy with its logo and alternating glass/dark panel design. 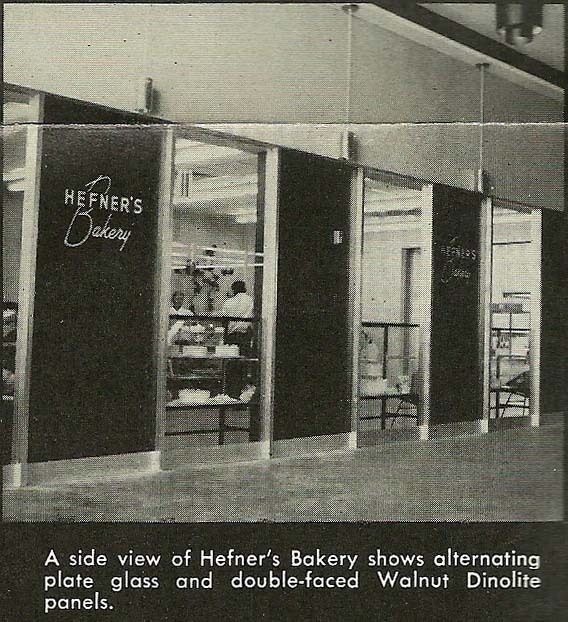 I wish malls and department stores still had bakeries. 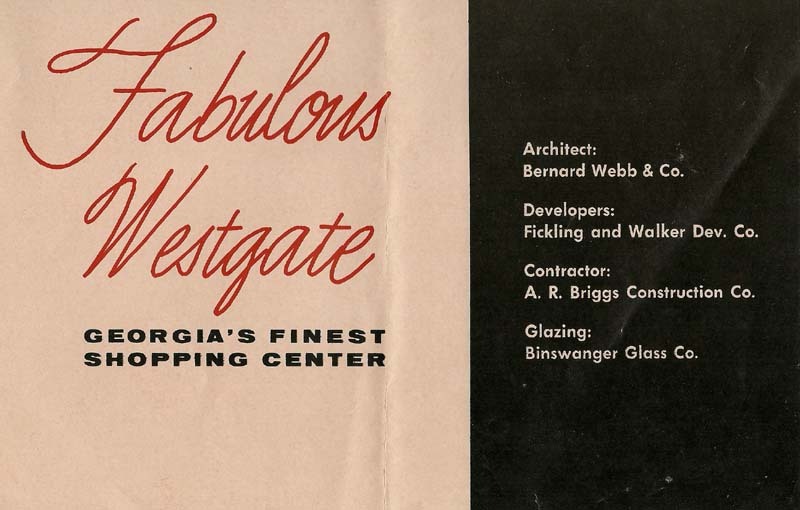 This was found on the front of the brochure crediting all involved in the construction of the mall. Bernard Webb, Architect; Fickling and Walker, Developers, A.R. 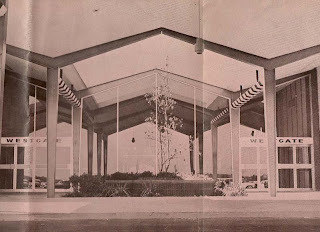 Briggs, Contractor and Binswanger Glass Co, Glazing. Binswanger produced this brochure prior to the mall opening. This passage in the brochure is both quaint and weird at the same time. I don't see the connection with peaches and a mall, but I would take seeing the inside of this mall over peaches. This was a really nice mall, especially for that era. Too bad it died so soon. this is a reminder of how much attention whent into design and individual shopfronts back in the days before unimaginative developers like DeBartolo dominated mall development. This also shows more attention to design than the typical strip center/plaza of the day. Honestly I have never seen such a well-designed mall for that era. It was too much ahead of its time, though, which made it impossible for it to catch up when department stores became the opus of malls. Hey J.T., really an interesting blog you've got. I'm really enjoying the mall history around the Georgia/Florida parts. Thanks again, will make sure to post about this place on my forum. This is one heck of a find! I think the block letters and water fountain at the front entrance were gone by the early 70s. I never remember seeing them. I remember the v-shaped steel beams in the mall serving as vertical supports in the wing east of Newberry's. The logo I remember is the Sixties-style flower with "West Gate" smack in the middle. Where was this mall? Street address in Macon? Would like to see what's left of it. It's located at Pio Nono Ave (US 41/SR 247) and Eisenhower Pkwy (US 80). Sorry I left that detail out. Yea! It's not much! The mall was NOT in the mountains for those seeing it. It was a hill the mall was on the then rest went down the hill then it was pretty flat. For a couple of years, Helen Popejoy from WMAZ-TV did a live broadcast on Monday, Wednesday, and Friday at 9:45 AM (just before the stores would open). It is sad to see south Macon be destroyed like the East Wing Of the Macon Mall. Why destroy?? 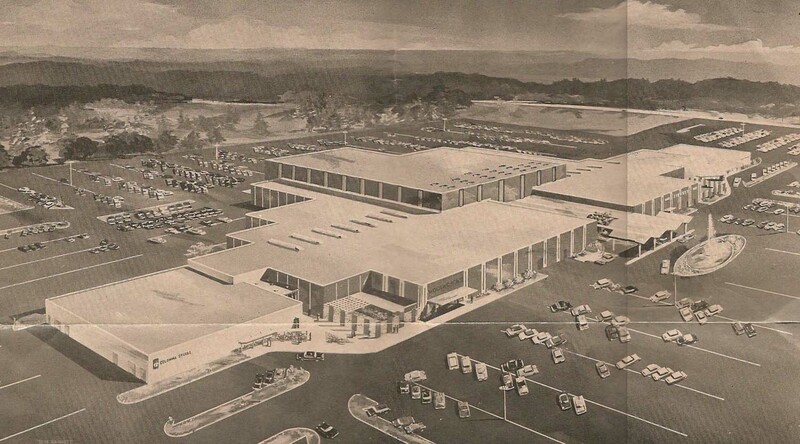 Make it a museum of the First enclosed mall of GA. Yep!!! It was amazing!!! When it was built it reminded me of Western Hills Mall in Fairfield, Alabama where some family lived. Anonymous from March, 2012 I get what you are saying. If Parisian and Dillard's moved in Westgate then the Macon Mall and Westgate would be doing well is my guess. They destroyed the mall to make way for a shopping center. It's not like they can rebuild it. Sorry! 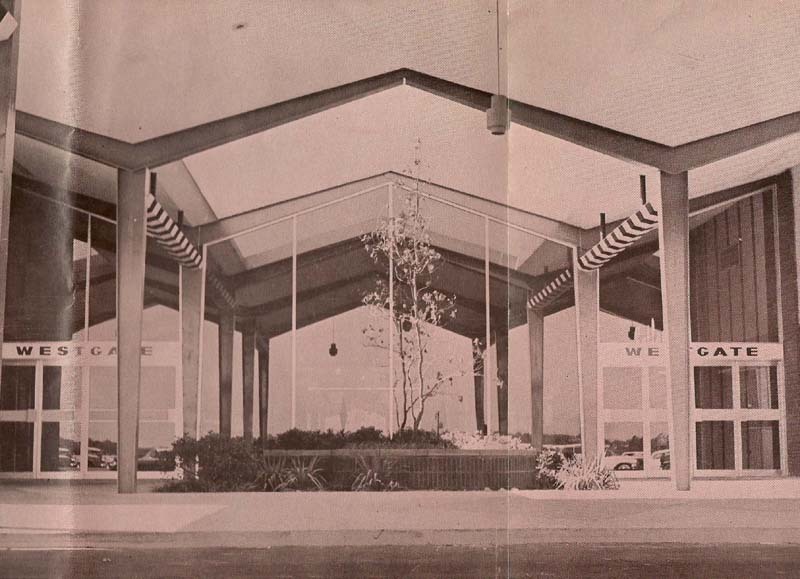 My best Macon Mall story is that when we had moved from Newberg to Placid Place, I'd heard that BARRY GOLDWATER would be delivering a campaign speech underneath the "WW" shaped front awning at Westgate Mall, probably late spring/early summer, but definitely 1964. I wanted to go, and was never accustomed to asking my parents for a ride anywhere, so I walked from Placid Place to the Westgate Mall. I was 11 years old and I attended the speech, and it was a good one. After, I shook Barry Goldwater's hand. That may have been my most memorable moment between birth and High School. PATENTAX_dot_COM.